The global rigid packaging market is projected to rise at a significant rate due to growing global trade for different variety of products. The application of rigid packaging is seen in heavy-duty packaging, liquid packaging, bulk packaging, chemical packaging, and secondary packaging were the flexible packaging fails to provide effective solution. Owing to its strong packaging form, that bears substantial load, along with insulating the reactive products from the surrounding and protecting it from getting damaged, rigid packaging is expected to grow even more in future years. The recent report published by Transparency Market Research (TMR), on the global rigid packaging market is projected to rise at 3.2% CAGR during the forecast period between 2016 and 2024. 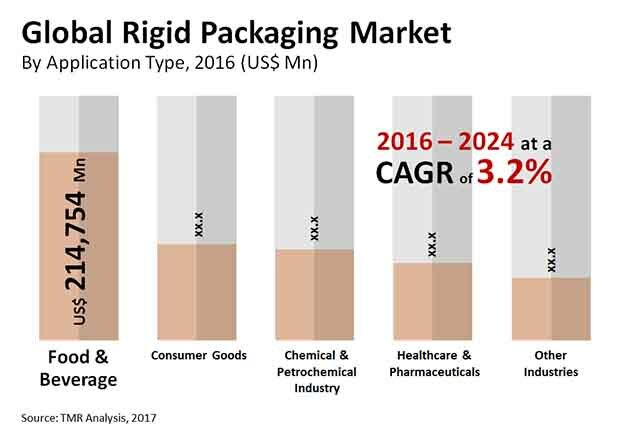 The valuation of the global rigid packaging market is expected to reach US$755.9 bn by 2024 progressing from US$589 bn earned in 2016. The global rigid packaging is categorized on the basis of product, material, and application. The application of rigid packaging is seen in chemical and petrochemical industry, food and beverages, healthcare and pharmaceuticals, consumer goods, and other industries. Of these, food and beverages segment is projected to dominate 1/3rd of the market by rising at 3.6% of CAGR during forecast tenure between 2016 and 2024. The changing lifestyle has increased the demand for packaged food, thus, it is stimulating the growth of rigid packaging market. In addition to that, growing demand for liquor, juices, energy drinks, and other beverages is also driving the rigid packaging market. Based on material type, the market is divided into metal, glass, plastic, wood, and paper and paperboard. Out of these, the demand for plastic and paper and paperboard is high is expected to account 70% of the rigid packaging market. The use of plastic packaging provides stability and is sturdy that have led to the growth of this segment. Moreover, plastic packaging can be changed into various shapes and sizes without compensating it quality. The paper and paperboard segment is also leading because it can be easily available and can be recycled. Based on product type, the global rigid packaging market is divided into trays, boxes, bottles and jars, containers and cans, and others. On the regional front, the global rigid packaging market is divided into North America, Latin America, Asia Pacific, Europe, and the Middle East and Africa. Asia Pacific is likely to lead the global rigid packaging market owing to the rapid growth of food and beverages industry and economic developments in emerging economies mainly in China and India. Changing lifestyle and trends in these countries is also benefitting the market growth in this region. In addition, the Middle East and Africa is projected to be the second most attractive regional market for the growth of rigid packaging in the coming years. The competitive landscape in the report elaborates on the key players of the market. Bemis Company, Amcor Limited, Sealed Air Corp., Berry Plastic Group, Inc., Resilux NV, Inc., Georgia-Pacific LLC, and Reynolds Group Holdings Ltd. are some of the leading players in the market. The geographical lookout for the global rigid packaging market shows that the Asia pacific is projected to lead the market in coming years. The reason for the growth in Asia Pacific are the countries having high growth in industrial sector. Europe and Middle East and Africa are also considered as lucrative markets for the growth of rigid packaging market. North America also gives growth opportunity for the rigid packaging market, but due to the shift from rigid packaging to flexible packaging, other regions have made efforts to grow the rigid packaging market. The competitive landscape for the global rigid packaging market is fragmented and is highly competitive vendor’s landscape. The big players are focusing on launching new products by adopting new strategies and through mergers and acquisitions taking place among the global players. Moreover, the players use new strategies to grow their customer base. Some of the global players in the rigid packaging market are Reynolds Group Holdings Ltd., Amcor Limited, Sealed Air Corp., Bemis Company, Inc., Resilux NV, Bemis Company, Berry Plastic Group, Inc., Holmen AB ADR and Mondi Group. The players are also focusing on emerging economies where there is high potential for industrial growth during the forecast tenure.